The first step in getting your loans back on track for repayment is to rehabilitate them. If you have Stafford or PLUS Loans, you’ll have to make nine on-time payments. For Perkins loans, you’ll have to make 12 on-time payments. You loan servicer should work with you to set the payment amounts at a level you can afford on your current income. Once you meet these payment requirements, your loans will be rehabilitated and all negative information will be expunged from your credit report. Once your loans are out of default, you can apply for Income Based Repayment (IBR) to get affordable payments that will fit your budget and that will get you on the road to loan balance forgiveness! 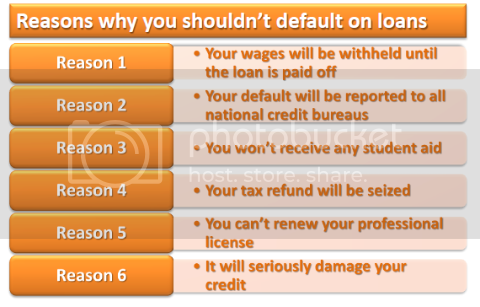 If you have more than one loan, one quick fix to get out of default is to consolidate your loans. A loan consolidation pays off your old loans and issues you one larger new one. This takes care of all of your old loans by paying them in full and gives you a complete fresh start. The downside is that your interest rate will likely increase, but the upside is a clean slate. Once you have your loans consolidated, you can immediately apply for IBR to ensure that your loan payments are affordable and you don’t get yourself in over your head again. IBR will also get you on the path to loan forgiveness so you won’t have to deal with your debt indefinitely. The caveat is that loan consolidation is a once-in-a-lifetime option. If you have been trying to pay your loans but simply can’t afford to and your financial situation isn’t likely to improve, you may be able to get your loans discharged in bankruptcy. Most people think that student loans cannot be forgiven in bankruptcy, but this isn’t true. It requires an additional filing (called an adversary proceeding) but it can be done. If you have a permanent disability that is keeping you from working and paying your student loans, you may be able to get them cancelled or discharged by applying to your loan servicer. If your student loans are from a program that you have not been able to be licensed for (electrician, engineering, cosmetology), you may be able to have your loans cancelled. To help get and keep on track with your student loans whether you’re just starting out with your loans or just starting over with a consolidation, sing up for Tuition.io’s free student loan management and optimization tool!